Well, it has been another beautiful week in Tuscany, despite the horrendous storm last Monday and another mini one on Wednesday morning. You will recall that I was concerned about the strada bianca, the white track, between our villa and the main road. I am pleased to say that on Tuesday morning I ventured out to find that it was passable, however, I was very glad of my four x four. The deluge of water had washed away a large part of it and particularly on the final hilly s-bend, where it had gouged out deep diagonal grooves. But we don’t care about that. It’s happened before and eventually a digger will come and put it right. 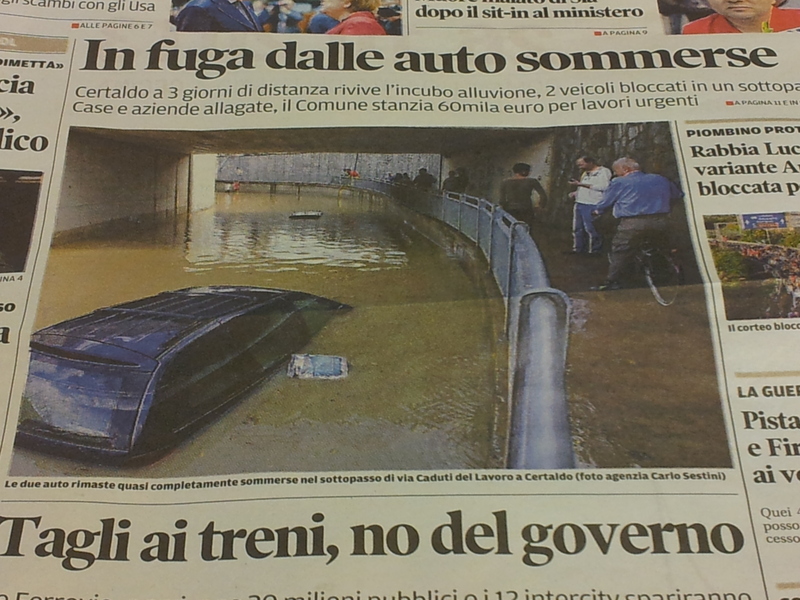 However, down in our local town of Certaldo, an important underpass had filled up will muddy water leaving two submerged cars in its wake! Otherwise, it has been gloriously sunny and warm. My man returned on Friday, having taken Gi Gi home and then completed some business in London. He was delighted to find that the storm had created a lot of work in the garden. He likes a good work out, being an ex-Royal Marine, and he soon set to clearing the drains of mud and debris. Then he started to attack the invading army of snails, which of course was my fault as I should have kept an eye out for them! They all get thrown down into the orchard and eventually reform their ranks, then march back up the hill overnight! However, that evening, the man was in good form and enjoying an aperitivo. I commented “How I would love to have an athlete’s body again. Well I did not exactly have an athletes body but…” and the man butted in and said “Yes you did, you had mine!” Oh, he does come out with some quick-witted remarks when he is relaxed and happy! Don’t you just love him? I do. Olive trees & autumn vines below our villa. Over the last couple of days, we have spotted a few small groups of olive pickers with their colourful nets stretched out under the trees. Did you know that technically, olive trees are actually bushes? Yes, I know, I’m a mind of knowledge. Later this morning, the man will go over to our friend Claudio’s cellars to fill our empty bottles with both old and new Chianti wine. 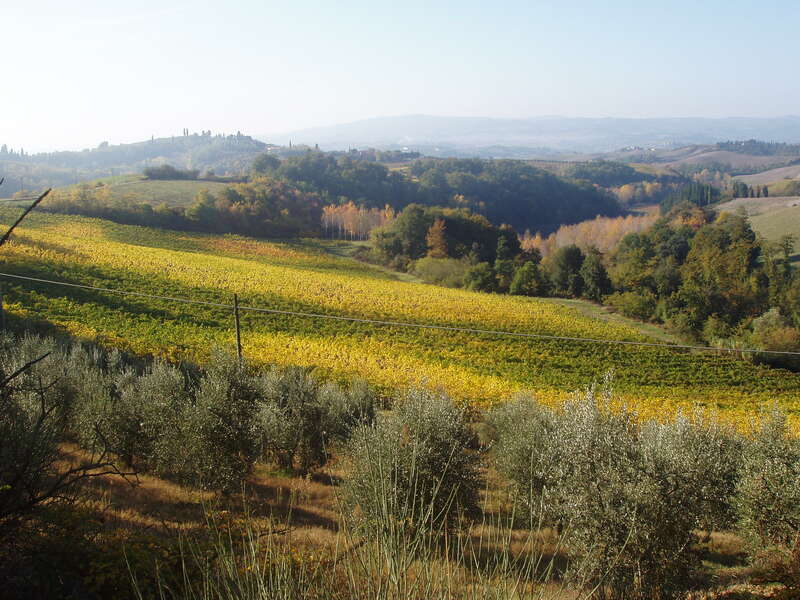 The Tuscans like to drink their wine young and many small wine producers consume most of their own produce. Claudio, however, exports all over the world. It’s also interesting to note that the supermarkets here rarely have imported wines on their shelves! 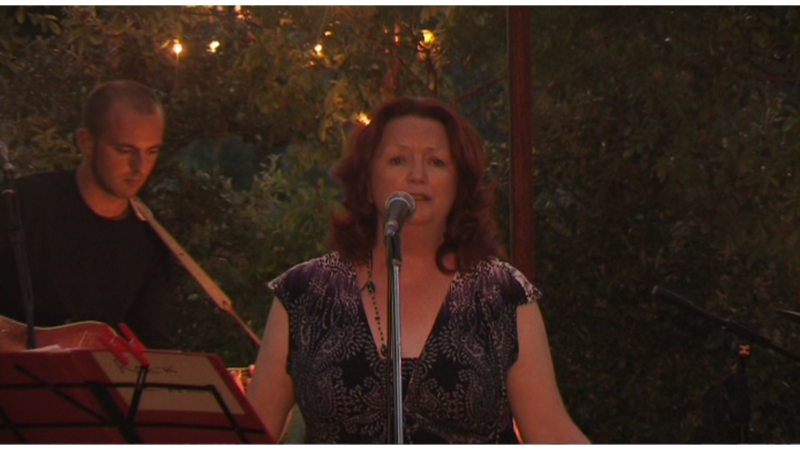 Many of you will know that as well as being a writer, I do a bit of rock singing. The Rock Chick Band is re-formed in June each year and we have a private rock concert in our garden. It’s important that I ready the repertoire well in advance and this I have just done. We do some old favourites every year, however, I have decided to include the fabulous Phil Lynott’s ‘Parisian Walkways’ , The Rolling Stones ‘Paint it Black’, George Harrison’s ‘If I needed Someone’ and as requested by my grandson, one of his favourites, Mumford and sons ‘Broken Crown’. I just need to have these approved by Stefano Bartalesi, my lead guitarist and boss! I’ll keep you posted. Back in the alimentari/bar in Fiano, we met our friends Claudio and Titziana this morning and we always fight over who’s going to pay for the coffee. This time I won. Sig Rotund made a comment that English women always seem to be in charge of the money, not so in Italy! It’s amazing how the Italian men are still fooled into thinking that they are in charge! I silently acknowledged the knowing smiles from the other women in the bar…. 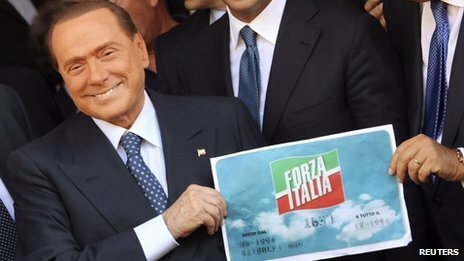 Meanwhile, the gorgeous Silvio Berlusconi, has risen from the ashes like a phoenix! He has re-launched ‘Forza Italia’, the centre-right party that brought him to power two decades ago. Leaders voted to suspend the PDL (People of Freedom party) and restore the old name. Deputy Prime Minister Angelino Alfano and other senior PDL members were not present at the meeting and a split may be on the cards. However, as SB has been bank-rolling (funding) the party it may prove difficult for them to officially break away. It’s fascinating isn’t it, that whilst SB is banned from being elected to parliament, he is not barred from leading a political party! Solo in Italia…. SB still claims that he was and is a victim of a judicial plot to remove him from politics. Meanwhile, his love life takes a back seat – no naughty comments please! Most of you will be aware that I am an avid reader. I am currently reading Christopher Creighton’s OpJB, the last great secret of the Second World War. This is a true story and I am absolutely riveted. What are you currently reading? Well, I must go and make myself beautiful for a visit to Ristorante C’era Una Volta for pranzo. I loved your mans comment about athletic bods you’ve had!! Great to hear the property is getting back to pre storm condition and the concert sounds like a great weekend, I look forward to reading about it. Ha ha! I think you have misinterpreted! I was wishing that I still had a body like an athlete (I used to be very fit and a runner), then my man turned the conversation around….. I am afraid to say that I cannot recall having had the ‘bodies of athletes’ however, I don’t remember the whole of the ’60’s, so you never know! Oh right! sorry, I did get muddled….I often have the same wish and I still run lol! Exactly. There was a rather thick purple haze in the late ’60’s…..